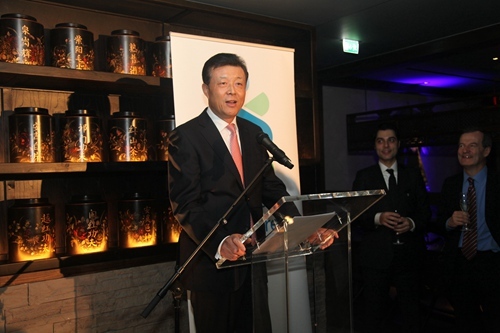 It is a great delight to join you at the Standard Chartered Chinese New Year reception. As you know, 2015 is the Year of the Sheep. According to Chinese tradition, sheep heralds a year of peace and prosperity. As this promising year begins, let me first of all wish everyone joy and prosperity in the Year of the Sheep! Standard Chartered was one of the first foreign banks to operate in China, with the opening of its first branch more than 150 years ago. In the more recent past, as China pressed ahead with reform and opening-up, Standard Chartered's business in China thrived with new vitality. l Today, you have 106 branches or offices in 29 cities on China's mainland. l In 2014, you introduced the RMB Globalisation Index. l Standard Chartered Bank China became one of the first market makers for direct trading between renminbi and pound sterling. l It also launched credit card business in China. I am confident that deeper reform and wider open-up in China will offer Standard Chartered and other foreign banks excellent development prospects. First of all, China's determination to shift the growth model promises a broad stage for foreign banks. Growth in China has entered a period of new normal. Consumer spending continues to expand. New services and hi-tech enterprises have mushroomed. These provide financial institutions with unprecedented and broad market. I hope Standard Chartered could develop new financial products and services to meet the need of the new normal and facilitate the economic transition and upgrading in China. Secondly, renminbi's internationalization provides foreign banks with significant business opportunities. l Statistics show that cross-border renminbi settlement in the first three quarters of 2014 was over 4.8 trillion yuan and involved 174 countries. l In the international financial market, renminbi has found its way into the traditional businesses of savings, loans, foreign exchange trading and inter-bank lending. l Renminbi bond issue is steadily growing in size. l Other renminbi denominated derivatives are also increasing in number. Foreign banks like Standard Chartered should seize the opportunities made available by renminbi's internationalization. In addition to years of experience in China, Standard Chartered boasts an extensive international network, outstanding professional strength and rich experience in innovating new products. All of these give you the competitive edge to get into the renminbi business. Thirdly, Chinese enterprises seeking an international foothold have a high demand for financial services. This will create a new growth point for foreign banks. China is already a big investor in the world. Chinese outbound investment has increased from 2.8 billion US dollars in 2003 to last year's 102.8 billion. In 2014, for the first time in history, China became a net capital exporter. Right now, China is joining hands with other countries in a vigorous pursuit of the "one belt, one road" strategy, namely the New Silk Road Economic Belt and the 21st Century Maritime Silk Road. In this process, Chinese enterprises are expected to quicken their "go-global" paces and will be in need of more financial support. Here, for Standard Chartered, there is a lot to do and there is a lot that can be achieved. The ancient Chinese philosopher Xun Zi said, "Carve but give up half way, even a decayed piece of wood will not break; Carve without stop, even metal and stone can be engraved." 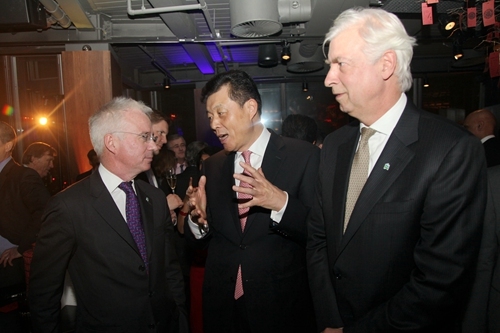 I hope that Standard Chartered will carry on the century-old tradition in the Chinese market, continue to expand the business in China, and step up cooperation with Chinese enterprises. I expect greater contribution from you in taking China-UK financial cooperation to a new level and pushing for further progress in China-UK relations.